On August 1, 2007, the I-35W St. Anthony Falls Bridge over the Mississippi River in Minneapolis, Minnesota, collapsed in the middle of rush hour, killing 13 people and shutting down a vital transportation corridor. 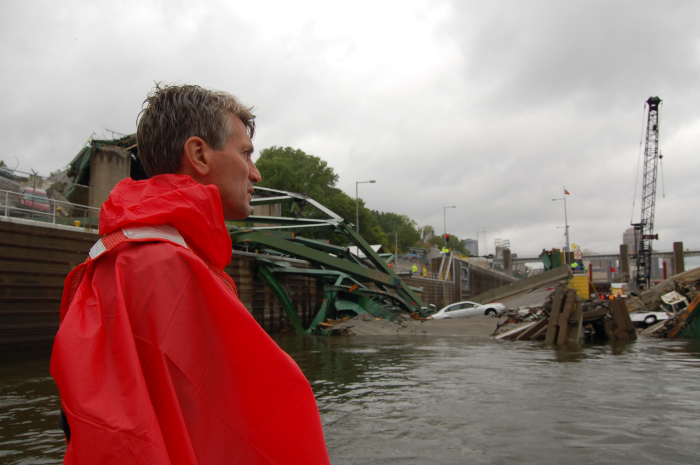 Replacing the bridge, understanding why it failed, and monitoring the new bridge to prevent future disasters became key priorities for stakeholders. What followed was a tremendously cooperative effort to quickly and safely replace the bridge, including Campbell Scientific instrument systems that continue to provide insight into bridge performance and long-term health. This first part of the program involved the Southbound Pier 2 columns and foundations. Strain gages and thermometers were installed to monitor the bridge and foundation system: (1) internal concrete curing temperature of the foundation elements, (2) construction loads, and (3) long-term performance. Phase 1 involved internal concrete temperature monitoring where thermistors verified that concrete temperatures stayed within acceptable ranges. Phase 2 relied on clusters of strain gages installed at four elevations in each foundation shaft (48 gages total). Gage clusters were designed to identify load-carrying contributions from various soil layers supporting the bridge. Each cluster consisted of four vibrating-wire strain gages positioned at quarter points around the circumference of the shaft cross section, and two resistive strain gages. In addition, clusters of four vibrating-wire strain gages were installed at two elevations in the two columns supporting the two southbound bridge girders. Mid-level gages were duplicated with resistive strain gages. The vibratingwire gages provide stable, long-term measurements, while the resistive gages allow researchers to measure short-duration dynamic events like traffic or wind loads. Data from Phase 2 monitoring shows increasing loads in foundations and how those loads were distributed down the length of the shafts as construction progressed. The graph shows the load on one of the shafts beneath the Pier 2 footing, correlated with construction milestones. Only 800 kips of the 3,000-kip applied shaft load was resisted in end bearing, and that about half the remaining load was carried by the rock-layer side shear. Load steps between May 29 and July 9 show the placement of each of the 15 box-girder segments. Phase 3 is ongoing. It uses the calibrations and correlations derived during Phase 2 to monitor the long-term health of the bridge. Variations in shaft and column loads can identify aberrant conditions, and alert officials to take appropriate actions. The vibrating-wire gages (including the internal thermistors) are read with a Campbell Scientific AVW200 and recorded with a CR1000 datalogger. The resistive gages are measured with Campbell Scientific’s CR9000 high-speed data-acquisition system. Both systems are self-powered with solar panels and deep-cycle batteries, and each system uploads data to a remote host server via Verizon cellular modem. This arrangement is designed to (1) allow the dataacquisition systems to operate independently of on-site construction power and communications, and (2) not interfere with day-to-day construction or operational activities. Key aspects to both data-acquisition systems are remote data monitoring, remote program downloading, and remote reconfiguration as the data-acquisition requirements change. This project demonstrates the benefits of the spectral analysis method for reading vibrating-wire sensors. Vibrating-wire gages are notoriously susceptible to electrical interference, but Campbell’s patented VSPECT technology eliminates this concern. The system was located 5 ft from a 1,000-kW generator. Even with the large generator nearby, no data was lost due to noise, and no extra analysis was needed to determine if measurements had been compromised by noise. In fact, the raw data was posted automatically to a publicly available website every 15 minutes, without review or qualification. Because of the success of the new method in this project, the program manager already has plans to make it a part of two future bridge-monitoring projects.